Gordon Elliott trained his first BoyleSports Irish Grand National winner as General Principle just got up in the final strides of a dramatic renewal under JJ Slevin. The nine-year-old gelding just touched off the Willie Mullins-trained Isleofhopendreams by a head in what may prove an important point in their ongoing battle for the trainers’ championship. The 3m5f event was always sure to be a grueling test of stamina with persistent rain all day leaving the ground very heavy, and just eight of the 30 runners completed the course. General Principle was one of a record 13 runners in the race for the master of Cullentra House, while Slevin enjoyed one of his biggest previous wins for the same connections with Champagne Classic in the Martin Pipe Conditional Riders Handicap Hurdle at Cheltenham last year. Bellshill made most of the running and David Mullins’ mount still travelled strongly turning into the straight with three fences to jump. However the steadier of 11st5lb eventually started to tell and he veered badly left at the final fence hampering Arkwrisht who in turn came across Folsom Blue. That opened the race up and Bellshill's stablemate Isleofhopendreams looked set to be the one to benefit most as he hit the front on the far rail. 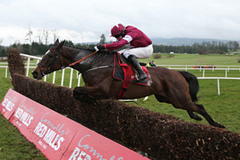 However General Principle came home strongly to just land the 250,000 euro first prize by a head. Forever Gold, who crept into the race at the bottom of the weights, ran a cracker for local trainer Eddie Cawley finishing just another half a length back in third under Adam Short. Bellshill was a further head away in fourth with Folsom Blue finishing strongly another three quarters of a length away in fifth, although those places were later reversed after a stewards enquiry. Elliott said, “He wasn’t one of my leading horses but it’s great to win. He ran very well in the race last year, and JJ gave him a great ride and it worked out great. I’m delighted. “To be honest there was that many of them coming to the last I didn’t know where to look. I was watching Folsom Blue as he was coming home strong but he got mowed out of it and was unlucky. Slevin (25) said, “It's unbelievable. I was delighted to get the ride off the lads. It's massive and it's great to get a ride in the race, I can't really believe it. “I never went for him and saved a bit the whole way, kept the bit in his mount, kept popping and kept saving. That's the main thing in that kind of ground and over that trip. I never really went for him until we landed at the back of the last. He really tried for me. “The main thing was lobbing away, keep him in his rhythm and keeping him comfortable. There was no point having him on his head. I wanted to have horses in front of me to keep me coming forward and to give him heart. I didn't want him in big open spaces and to get lonely. I was riding him to finish out his race and run well.